I was interested to read recently about Norway's largest sovereign wealth fund, the Government Pension Fund Global (apparently the world's richest fund) dropping some of its shares in fossil fuel funds. "part of a fast-growing campaign...over $50bn in fossil fuel company stocks have been divested by 180 organisations on the basis that their business models are incompatible with the pledge by the world’s governments to tackle global warming. But the GPFG is the highest profile institution to divest to date." However it still invests heavily in fossil fuels and has since reinvested some of those resources into oil and gas. The general trend, though, is encouraging and the pressure on large investment bodies to reassess and justify where they put their money is definitely growing. "... A series of analyses have shown that only a quarter of known and exploitable fossil fuels can be burned if temperatures are to be kept below 2C, the internationally agreed danger limit. The divestment movement is growing in response to this realisation. Members of several large Danish pension funds are to be asked to vote on divestment and, closer to home Boris Johnson has been called on by the London Assembly to "change the city's investment policy to exclude fossil fuels." ... except this one: that we had not done justice to this huge, overshadowing, overwhelming issue of how climate change will probably, within the lifetime of our children, cause untold havoc and stress to our species. So, in the time left to me as editor, I thought I would try to harness the Guardian’s best resources to describe what is happening and what – if we do nothing – is almost certain to occur, a future that one distinguished scientist has termed as “incompatible with any reasonable characterisation of an organised, equitable and civilised global community”. My last quote given below comes from a particularly powerful article which makes a key point by questioning the effectiveness of relying on broader reasons to persuade investors to divest due to one of the key characteristics of the typical investor - how they are prone to isolate the process of investing from the actual purpose of money and the part it plays in their lives. "Indeed, investors often fetishise monetary returns without thinking about the world in which those monetary returns will have to be spent. This is partially due to misunderstanding the nature of money, which is best thought of not as an independent “thing”, but rather as a claim upon society. What is the point of amassing such monetary claims if the society in which I can use them in has become a lot less liveable?" So many people worry about inheritance tax. They go through all sorts of loops to pass on their pensions and property and preserve their assets for their children without even acknowledging the truth that none of this will be of much help to those children in a world completely destabilised by climate change. Logic should now dictate the course of action to both institutions and individuals. No-one should need persuading any more. In the case of climate change I fear we have already got past the stage of fiddling our way through the burning and it's now just a matter of how much damage limitation we can plaster over the wound. This particular issue is very close to my heart but the quote about the way that investors "fetishise" money also sparked my interest in a more general way. I see it in myself, the slavish obsession with tweaking spreadsheets, calculating strategies to claim back and avoid paying tax (incidentally something I'm beginning to feel more and more uncomfortable with - I have a feeling that I should be examining my own "fetishistic" behaviour in this particular arena and comparing it with the kind of world I actually want to live in), fiddling about trying obsessively to lower charges and generally spending lots of my valuable "free" time doing things that I have not "costed" against the returns.. maybe one for a later post. Alas, I'm guilty of investing in fossil fuels (funds and shares) but I have you to thank for having me look at things like Abundance with regards to investing in renewable energy (deposit just made so should be able to invest next week). Right, am invested in Oakapple Two now - chose that one as there was an extra bonus if I applied before end of March. How was your interest payment made - by bank transfer? I don't recall completing my bank details when I applied, unless I did and have forgotten! Hi weenie. Interest payments are made directly into your Abundance account and there's a Deposit/Withdraw facility in the "My Account" section for you to move funds out to your bank if you wish. 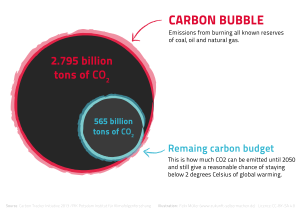 Interesting equation - how do we 'save' the planet and at the same time, continue with 'business as usual'? Too true - as it is "business as usual" that has got us where we are. You're right. Taking responsibility and practising what you preach/acting in a way that you would wish others to act even if you have little hope that they will actually do so, is key to having credibility. I'm going to gradually go through my investments and try and work out which of my funds are probably the "worst" from the point of view of fossil fuels and make a start at reducing my stake in this area. Haha, it just came up in my news feed. Think it's a great idea and hope it'll take off in some way! Although if it ran out of 'gas' partway through a journey, would the passengers be asked to 'provide' haha? But seriously, we do need people to be thinking creatively about energy production. Thanks for sharing the link. "I have a feeling that I should be examining my own "fetishistic" behaviour in this particular arena and comparing it with the kind of world I actually want to live in" - This is true for me too. Investing for the future can, without a bit of care, become a completely selfish thing. And that's a little bit sad. I don't think looking at reducing the tax we pay or investing in "oil" companies is a bad thing in itself, but when the only thing that matters is personal profit it's going that way. but when the only thing that matters is personal profit it's going that way.. That's the crux of the matter ,along with not even recognising where your own "personal profit" lies - and that it isn't always tied to money.